Your privacy is important to us. To better protect your privacy we provide this notice explaining our online information practices and the choice you can make about hte way your information is collected and used. To make this notice easy to find, we make it available by linking to it from the bottom of every page on Offices.net. • Other information relevant to helping you find office space. We use the information to correspond with you about your office space requirements. We do not share the information we collect with outside parties except to the extent necessary to fulfill your requirements such as sharing your details and office space requirements with our partners and office providers. We use non-identifying and aggregate information to better design our website. We do not disclose personally identifiable information to outside parties except to the extent necessary to fulfill your office space requirements. 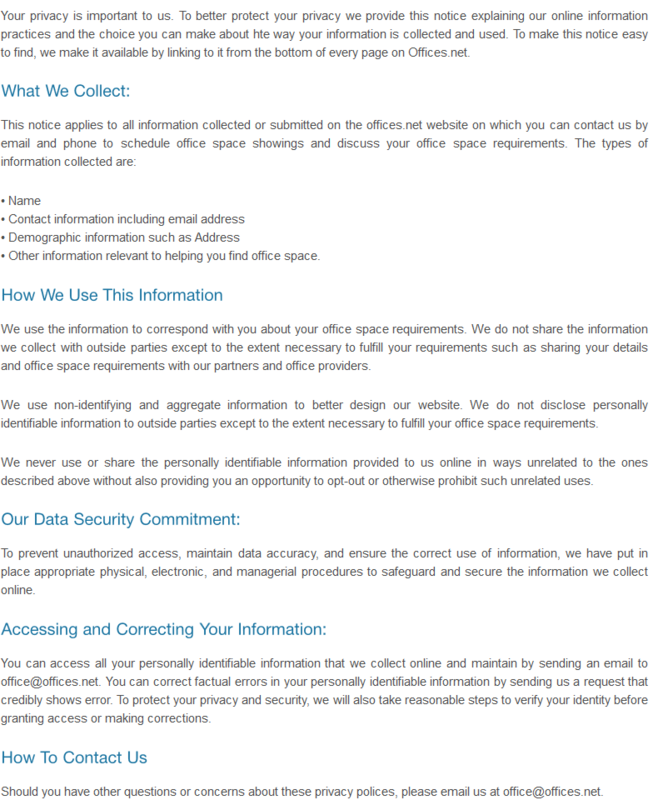 You can access all your personally identifiable information that we collect online and maintain by sending an email to office@offices.net. You can correct factual errors in your personally identifiable information by sending us a request that credibly shows error. To protect your privacy and security, we will also take reasonable steps to verify your identity before granting access or making corrections. Should you have other questions or concerns about these privacy polices, please email us at office@offices.net.